Built with copper-infused foam and an interior system of springy coils, the Alexander Signature Hybrid from Nest Bedding aims to combine all the best aspects of your favorite mattresses for a truly stellar sleeping experience. Today, I gave the hybrid a whirl to see how well it actually performs and to figure out what kind of sleeper would most enjoy it. I should note that this bed comes in three different firmness options, but I’m just taking a look at the medium firmness model. 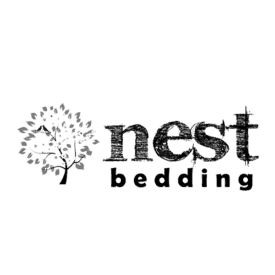 Continue reading below for my full review of the Nest Alexander Signature Hybrid mattress. Don’t have time to read it all? Click here to skip to the bottom and check out my review summary. 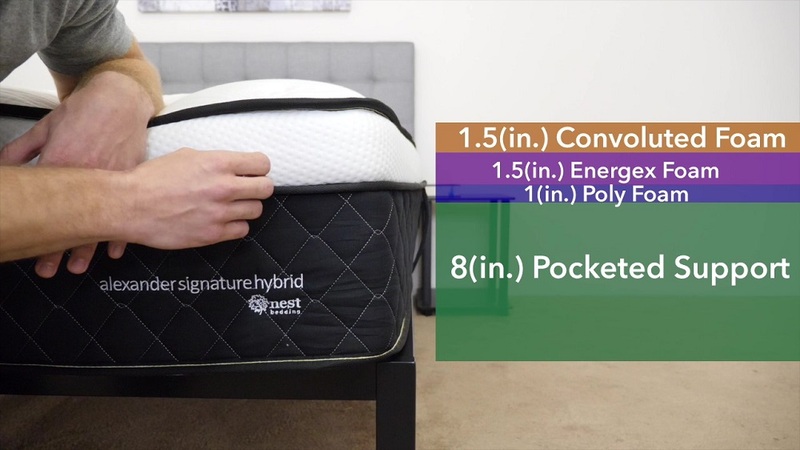 See how the Alexander Signature Hybrid stacks up against other hybrid mattresses! The Alexander Signature Hybrid is made up of four layers of foam and pocketed coils, stacking up to an impressive 13.5” of comfort. The combination of materials is meant to fuse the pressure-relieving benefits of foam with the supportive bounce of innerspring technology, so I’m excited to dig into these layers to see just how well they work together. Cover – The cover is made up of a thin Cotton/Polyester material that’s soft and breathable. 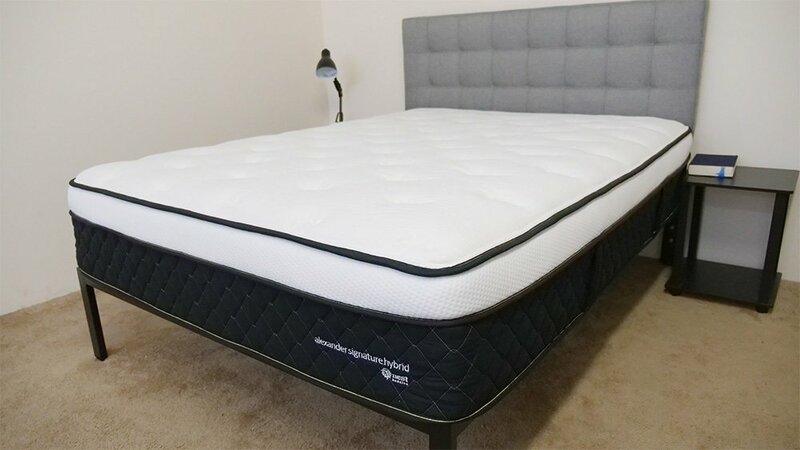 It’s also quilted with 1.5” of gel memory foam that makes for a pleasant pillowtop feel, giving the bed some immediate comfort. Comfort Layer – Below the cover you’ll find a comfort layer constructed of 1.5” of convoluted foam. The gentle material provides pressure relief to the sleeper and the wavy design encourages some nice air flow through the mattress, meaning you won’t sleep too hot during the night. Bounce Layer – Next up we’ve got what I’m calling the “bounce” layer made up of 1.5” of Energex Foam. 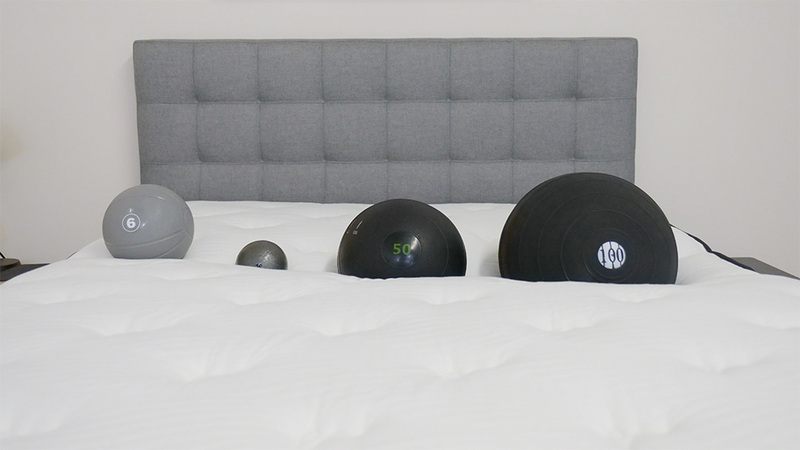 This latex-like foam is heartier than the one used in the comfort layer and supplies the bed with some quality support and—you guessed it!—bounce. This section will help lift you up and out of the bed so you don’t feel stuck. Transition Layer – The transition layer is built with 1” of polyfoam. The main function of this layer is to act as the meeting ground between the foam and innerspring components of the mattress. Base Layer – And finally, the base of the mattress, which is comprised of an 8” pocketed coil system. The springs imbue the bed with most of its supportive bounce and because they’re individually wrapped, they’re able to isolate motion super well. The height of this section also allows for increased air flow and cooling throughout the entire structure. After taking a look at the construction of the Alexander Signature Hybrid, let’s chat about the firmness and feel. I started off with light hand pressure and felt some satisfying snugness from the quilted cover and top foam layers. Pushing in further, I began to interact with the buoyant Energex Foam and pocketed coil system, which lifted me up and out of the mattress. At this point I’d like to note that people of different body types and shapes will feel firmness differently. 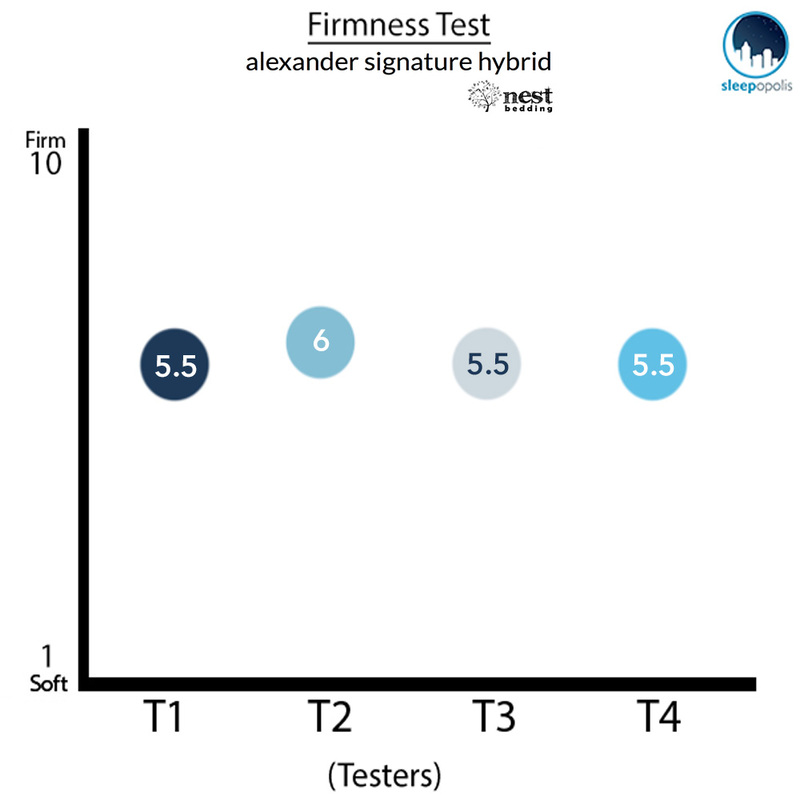 Rather than giving just my opinion on the overall firmness level of the Alexander Signature Hybrid, I enlisted three other people to give their opinion as well. 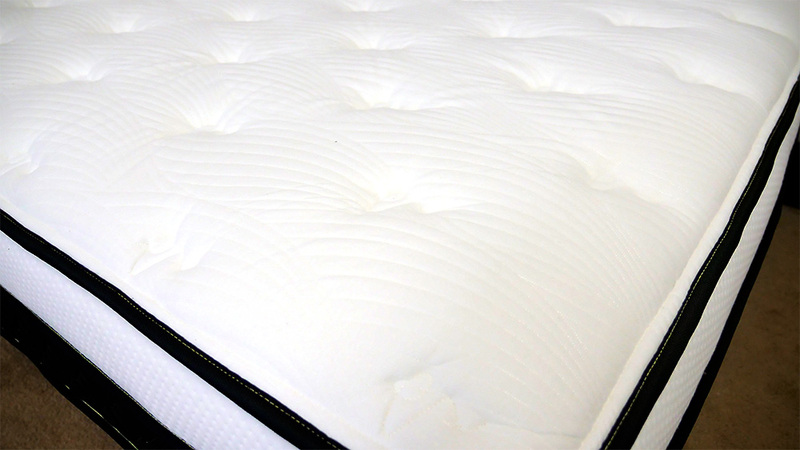 This will give you a better sense of the firmness range you can expect from the mattress. As you can see in the graph above, my testers were pretty much in agreement about the feel of the hybrid, giving it an average firmness rating of 5.6. When compared to the industry standard of 6.5 for medium firmness, it’s clear that this bed is on the softer side of a medium firmness. I personally gave the mattress a rating of 5.5. Even though the hybrid is constructed with a substantial innerspring section, the top foam layers create a feel that’s pretty plush and pressure-relieving. 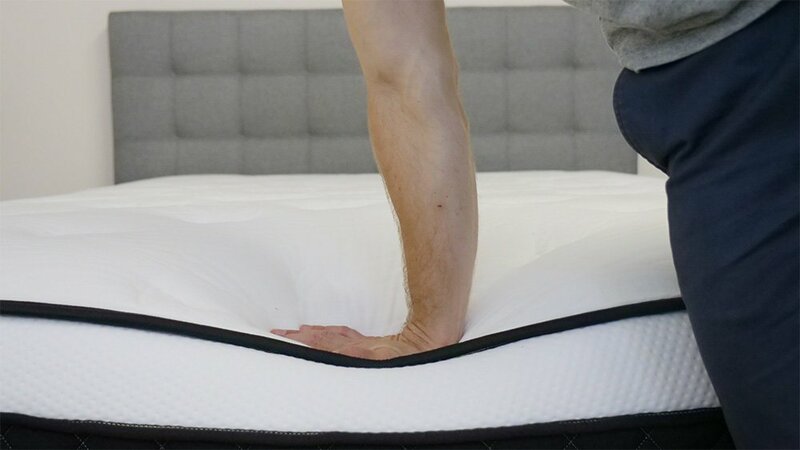 Even for this relatively soft firmness, the pocketed coils ensure that you’ll always feel like you’re sleeping on top of the mattress as opposed to in it. Rather than just describing the feel of the Alexander Signature Hybrid to you, I wanted to give a visual representation of where someone may feel pressure points form while lying on it. To do this, I placed a pressure map on top of the mattress and lied on my back, side, and stomach. You can see the results on the image below where pressure is represented from blue (low pressure) to red (high pressure). Back – Lying on my back, I felt both great pressure relief and support. While the top of the mattress is indeed gentle, it doesn’t have that sinking feeling of traditional memory foam, so my spine alignment wasn’t thrown off like it sometimes is on less firm mattresses. Side – Rolling onto my side, I thought the mattress did a great job of supporting the side sleeper trouble spots i.e. the hips and shoulders. The foam and innerspring sections worked in tandem to provide excellent pressure relief and kept me feeling comfortable in this position. Stomach – Once on my stomach, I continued to feel well supported by the mattress. My back was in a good alignment and my hips didn’t sink in to the bed too much. I should add that it was very easy to switch between all three of these positions. 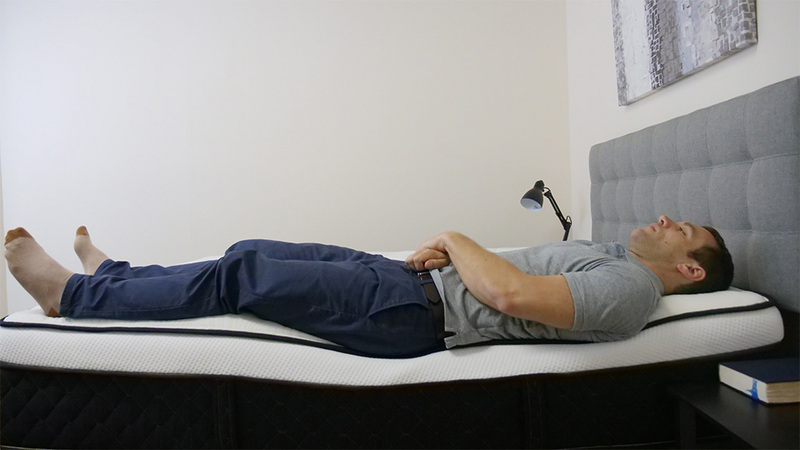 The Alexander Signature Hybrid shows an average amount of disturbance for the 4 inch drop, which simulates someone rolling around and adjusting their position on the other side of the bed. 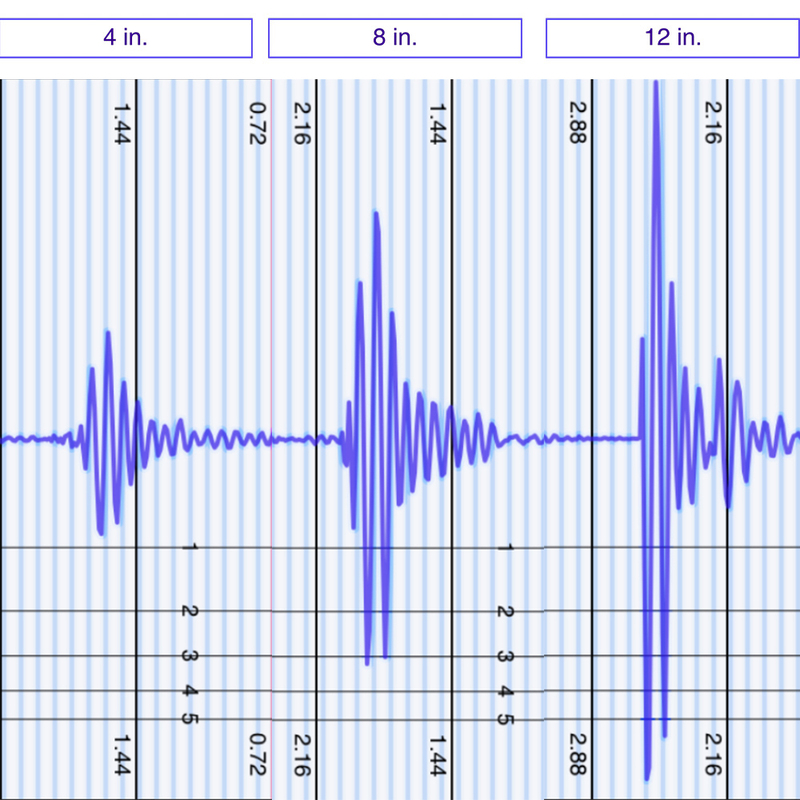 While the 8 inch drop also shows a fairly average amount of disruption, the dramatic spike in movement at 12 inches demonstrates that the mattress isn’t the best at containing motion. 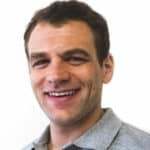 While the individually wrapped coils do dissipate some of this interference, it’s likely that you’ll feel your partner moving around at night. 6 lb medicine ball: 2 inches of sinkage. 10 lb steel ball: 3.5 inches of sinkage. 50 lb medicine ball: 6 inches of sinkage. 100 lb medicine ball: 7.5 inches of sinkage. As the visual demonstrates, you will experience some sinkage with the Alexander Signature Hybrid because of its soft foam top layers. 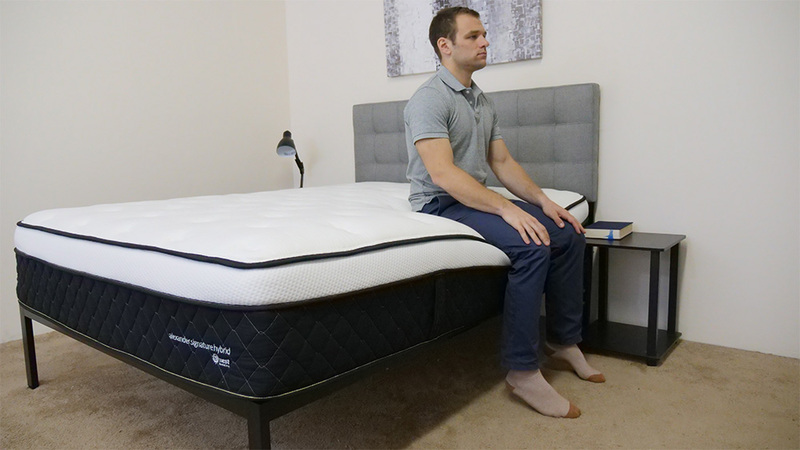 However, this sinking feeling is different from what you’d get with a more traditional memory foam mattress as it’s mitigated by the bed’s supportive pocketed coil system. This means you’ll sink, but will still be able to move around easily and get out of bed without too much effort. Lying on my back near the side, I was evenly supported and felt as secure as I did when I was in the center of the mattress. While there was a bit of compression from the top foam layers, the pocketed coil system helped to lift me out of the bed. There’s good bounce to the mattress, so I was able to shift over to my side easily. Again, there was some compression in this position, but nothing that detracted from my comfort. In this position, I wanted to simulate what it would feel like to be sitting on the bed in the morning when you’re lacing up your shoes and getting ready for the day. 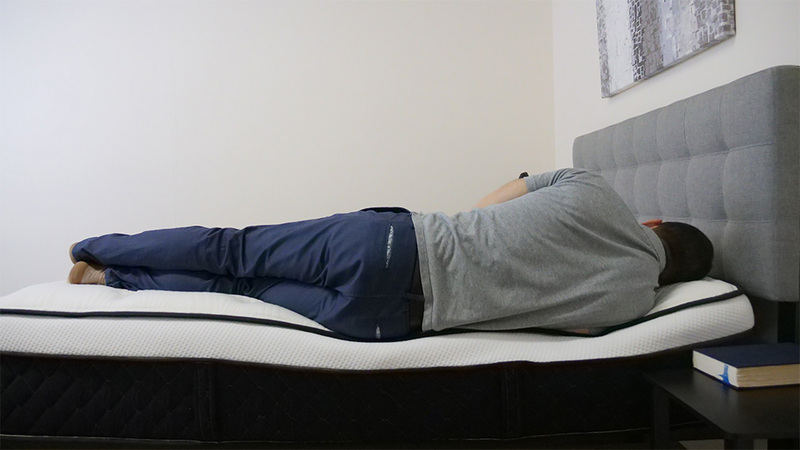 A lot of foam mattresses experience severe compression in this position, but the Alexander Signature Hybrid actually held up fairly well. If you’re convinced the Alexander Signature Hybrid is the right mattress for you, the size and pricing information for the mattress are below. Please note that these prices reflect standard pricing, but you can use the code SLEEPOP8 to save 8% on your Nest purchase! IS THE ALEXANDER SIGNATURE HYBRID MATTRESS RIGHT FOR YOU? Now that we’ve taken a closer look at the Alexander Signature Hybrid mattress, it’s time to discuss who it’d be a good fit for. Anyone who needs to sleep cool – This hybrid does a fantastic job of isolating and dispersing heat, resulting in a sleeping experience that’s wonderfully cool. Sleepers in need of extra support – In spite of the soft foam top layers, this bed is extremely supportive, thanks to the 8” of pocketed coils in its base. Pressure relief without feeling stuck – While there’s some great sinkage here, it’s not as dramatic as it would be on a typical memory foam mattress. This makes for excellent pressure relief without that stuck-in-the-bed feeling. For more information on the Alexander Signature Hybrid, check it out here!